Enjoy a visit to a traditional bull farm. Learn about the Spanish brave bulls in the countryside only half an hour away from Seville. Feed and meet fierce bulls in their natural environment. Transportation in fully-equipped motorcoach and English Speaking Local Guide who is an expert on Bullfight. Enjoy traditional cuisine, in the middle of nature, watching the bulls. This private bull and horse farm tour is about 5 hours long in total including a traditional lunch. If you want to meet fierce bulls and their natural environment, talk to the people who live close to the land and them, then this is the tour for you! You will have an unforgettable experience in the Andalusian countryside without haste, tasting every moment, understanding the culture and the tradition of this way of living. Fierce and brave bulls (toros bravos) are a special breed raised up to develop a natural instinct for fighting. Therefore it is the only breed used for bullfighting. This kind of bull live in the Andalusian countryside, in semi-liberty or assisted liberty. In the Mediterranean area, as well in the Oriental area, the bull has always had a symbolical value being an animal admired by all civilizations through history. The fierce bull have had a main role in art, history and anthropology during several periods and cultures. Bulls are animals that carry a special symbolism that expresses universal feelings: beauty, strength, elegance, mystery, power, fertility, etc. For these reasons, bulls have always been present in the tales, legends and myths since the beginning of mankind in prehistoric times. You will be able to admire and touch these wonderful horses, colts and mares, attend to a dressage exhibition of the best champions of the cattle. Surrounded by beautiful landscape and a country sight it will be a very relaxing experience! A gastronomical experience with a guided tour of a livestock of fierce bulls, Spanish horses! Our private English-Speaking chauffeur will pick you up from your hotel. Just a short half-an-hour drive to the countryside land of the Spanish Bulls and Horse. On arrival to the farm meet our guide who is an expert on Bullfight and how the bulls are raised. The tour is about 2 hours long. You will see the bulls very close following animal welfare regulations and you will learn about the fierce breed. You will even get a chance to feed the bulls with the help from the cowboys! Lunch: You will have some appetizers from the area which are in season and the main course, dessert and coffee we will eat in the dining room. After the farm tour your private chauffeur will take you back to your hotel in Seville. Drop off at your hotel and final goodbye from our driver. 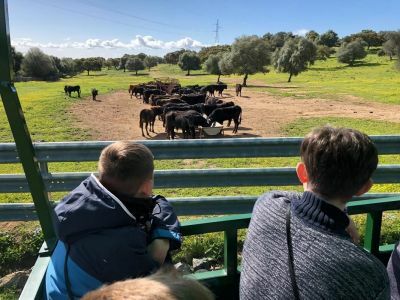 2hr Bull Farm ranch tour with a guide who is an expert on Bullfight and how the bulls are raised. (L): Traditional Lunch with local cuisine including appetizers, wines and main course with dessert, etc.. NOTE: Or similar type vehicles in the same class as mentioned above.